What’s the big deal with brewing tea with the right water temperature? Have you ever made a cup of tea & it just didn’t taste right? When I was in my 20’s I was working in a small family run business. One of my tasks was to make tea for the guys when they came in for morning tea. On my very first day, I got the orders (each had their own special preference) & went on my way. I got a little side tracked, answering the phone & came back & served everyone their tea. Well let me just say in my defence that, I really thought I had boiled the kettle! I hadn’t… & brewed the tea in cold water. There were fits of giggles & laughter & tea spitting… I still haven’t lived it down! Brewing Green tea would be the most concerning. As the leaves are young & tender they will scold & burn when steeped in boiling water leaving the tea tasting bitter. It’s important to brew most Green tea with water that is around 70°. A fancy ‘boiling to the right temperature’ kettle can do this for you or you can boil (your normal) kettle, pour it in your pot or cup then leave it for a few minutes, then steep your leaves or place your Pyramid tea bag in, without causing it to burn. 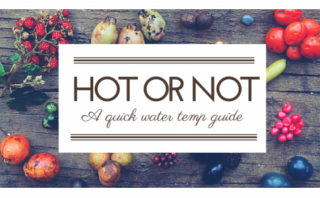 You will get the best tasting brew every time if you monitor the water temperature. White tea should also be treated the same as Green tea. The leaves can be re brewed a few times without losing its flavour or becoming bitter. Oolong tea brewed at around 80° to 90°. Herbal blends are best brewed in boiling water. Most herbs & spices need that boiling temperature to release all their flavours. Herbal blends can be brewed for up to 5 minutes, this allows time for all the ingredients to blend together. Black tea should be brewed in boiling water, as the leaves are fermented they need the heat of the boiling water to help release their flavours. Why become a "My tease" member?